Somehow, when I think it’s about time for my dog to get a bath, he becomes a mind reader and tends to disappear. Once he sees I mean business, stacking towels and testing water temperature in the kitchen sink, he doesn’t struggle. He does, however, have an adorable little pout. If your dog is as aware of your plans as mine is, you need to start bath time with a strategy and some important information. Let’s begin with the basics. The frequency depends on several considerations. Your dog’s life style and type of coat are your indicators, not whether there’s a football game on TV that you’d rather watch. The rule of thumb for most dogs is to give a bath about once a month. There are many exceptions, of course. Harsh-coated dogs need less frequent bathing and soft-coated long haired pups like Yorkies and Maltese may need a scrub weekly. Use good quality dog shampoo. Your dog’s skin is probably more sensitive than your own. Finish up the bath with a conditioner to help replenish the oils in his skin and be sure all shampoo has been rinsed clear. You can make a good final rinse with a pail of warm water and 1/2 cup of vinegar. Choose the best spot to wash the dog, determined by the limitations of your home and the size of your dog. Doggie tubs are available, but kitchen sinks or bathtubs work just as well. Avoid hosing your furry friend down outside. Dogs are just as sensitive to chill as we are and the water pressure from a garden hose can be rough on their skin. The plan includes choosing the best place for the bath. From kitchen sink to bathtub or shower, or even outdoors with a hose, the spot should fit the dog. Make a list of what you will need, as thinking of an important item once your dog is covered in suds is not helpful to a pleasant experience. Outdoors is fine in temperate weather and with the water pressure turned low in the hose. ​You‘ll want to remove his collar for a laundering and thorough drying, but you might replace it with a spare one so you have some control during the bath. If you bathe the dog with collar on, be sure to rinse very carefully around it and take it off so his neck can dry completely. ​Then, if using a sink or tub, run comfortably warm water before bringing the dog to the water. Test the water temperature just as you would before giving your dog a bath. Lukewarm water is better for the dog than very hot. The sound of running water may cause more stress than necessary. Save yourself some grief by placing some steel wool over the drain to catch loose hair when you empty the bath. ​Finally, lead or carry your pet to the spot, offering a treat or two and some kind words. Before immersing him in the bath, be sure to brush out any tangles or debris in his coat. Dry hair is much easier to work with than wet. Gently block his ear canals with cotton balls to prevent the problems that water in his ears can create. With your non-skid surface and pleasantly warm water in place, put the dog into the water and thoroughly wet him. Be sure to avoid getting water in his face by starting from the neck and working back. Don’t miss wetting his chest and belly. ​Now it’s time for the real fun. Shampoo is up next. Whether you use a bar or a liquid, it’s important to get a good quality dog shampoo. If you choose a bar, rub it all over to spread the soap, then gently massage with your hands to suds him up. With a liquid, pour a stripe down his back from neck to tail, then follow with your hands. Using a washcloth and clear water, carefully clean his face and skin folds. If your dog’s hair is thick, you would do well to dilute some shampoo with water and have it handy, as it will be easier to apply it more evenly over his entire body. ​Once you’re sure you’ve hit all the spots, not forgetting between the toes and under the armpits, start to rinse off the soap. Rinse. Rinse. Rinse some more. When you think it’s enough rinsing, do it just one more time. Shampoo left in the hair can cause hot spots and itching. Drape a towel over the dog’s back immediately upon finishing the last rinse. It will provide some measure of protection for you and the surrounding area. 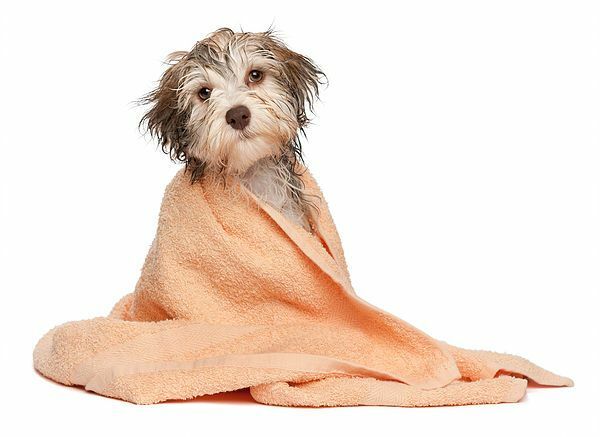 Rub the dog all over with dry towels, paying particular attention to his face and paws. If he is long-haired, be sure not to leave any hidden wet spots that can be breeding grounds for skin problems. Some dogs will also tolerate a blow dryer and this helps ensure a thorough drying job. It’s important, however, to use the dryer on a low heat setting and to keep it moving. Blowing constantly in one spot can cause skin damage. You can also see our dog hair clippers review.